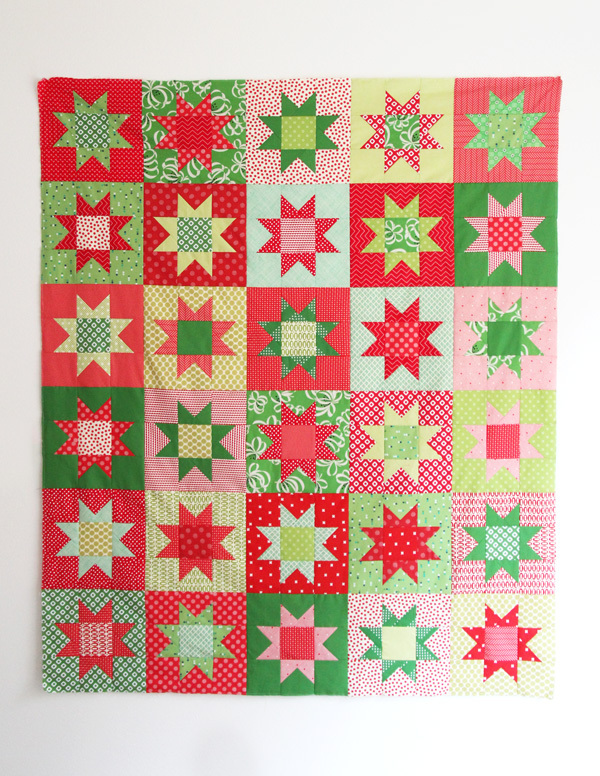 I’ve decided that each year I should make a Christmas quilt top in December, and put it away to finish the next year. 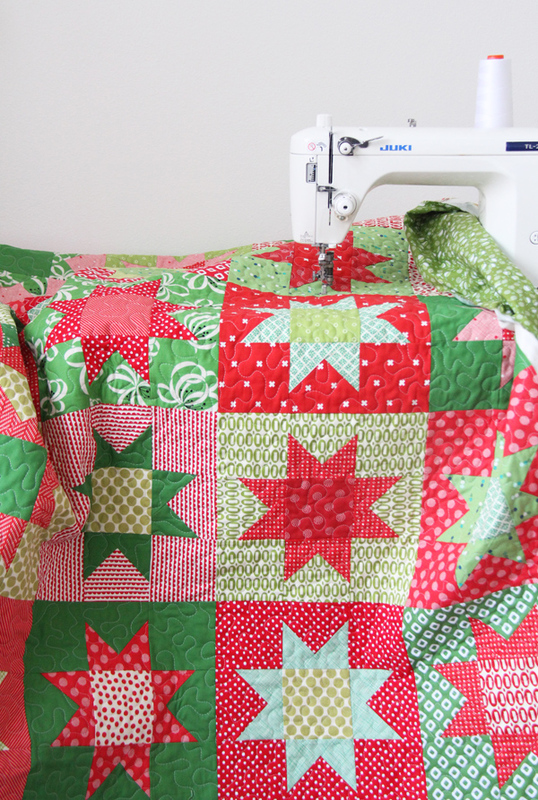 It’s so fun not only to work on a new Christmas quilt top in December, but also to finish a new one to use that year! This is my all time favorite stars pattern. After I wrote the pattern I had so many people ask me why I called it “No Point Stars”. It’s because there are NO STAR POINTS to match up or worry about sewing off!! I free motion quilted it on my Juki after I spray basted it (tutorial here for how I spray baste). I’m a big fan of this quilt. The fabrics are a huge assortment of reds and greens from my stash that I collected over the years. The only downside to this pattern is it uses a lot of fabric, and when that happens I try to compensate by throwing in at least a few solids, and use up large scraps or random cuts. It also tends to look very “busy”, so make sure you use solids, and a lot of small blender prints along side large prints. This would also be beautiful with an all white background…maybe a Fourth of July version needs to happen? The kids don’t have school Friday so I think it will be sugar cookie making day. I love having lots of cookies in the freezer to pull out and give to neighbors, friends, stuff in my face at 11 pm, or leave out for the UPS man who comes to my house literally every. single. day. Sometimes twice. This is my favorite recipe EVER. The cookies don’t spread too much, and the frosting dries glossy and hard so they don’t get ruined! 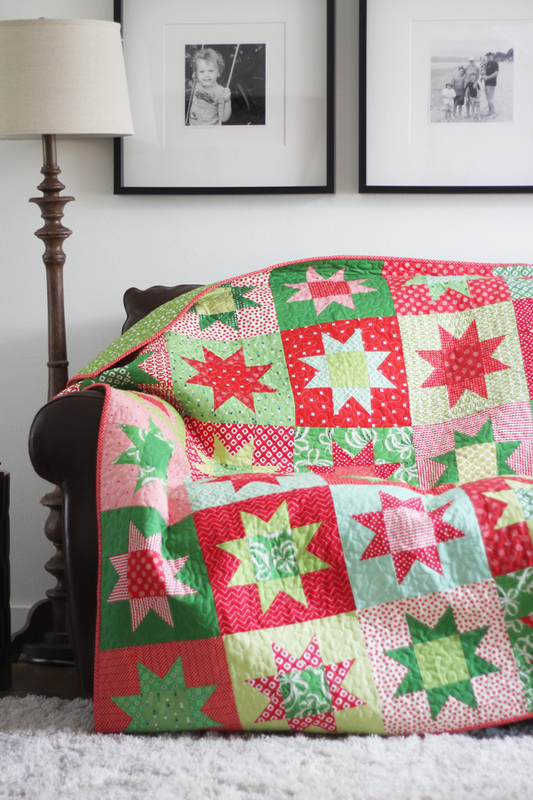 I completely agree, you can’t have too many Christmas quilts! This is so fun and festive and I love the no points thing. Sometimes a gal just wants to sew and not have to worry about matching points. Thank you for sharing the pattern! What a great idea!!! I think I’ll jump in also and have this pieced by Dec. 31 to quilt in 2019. 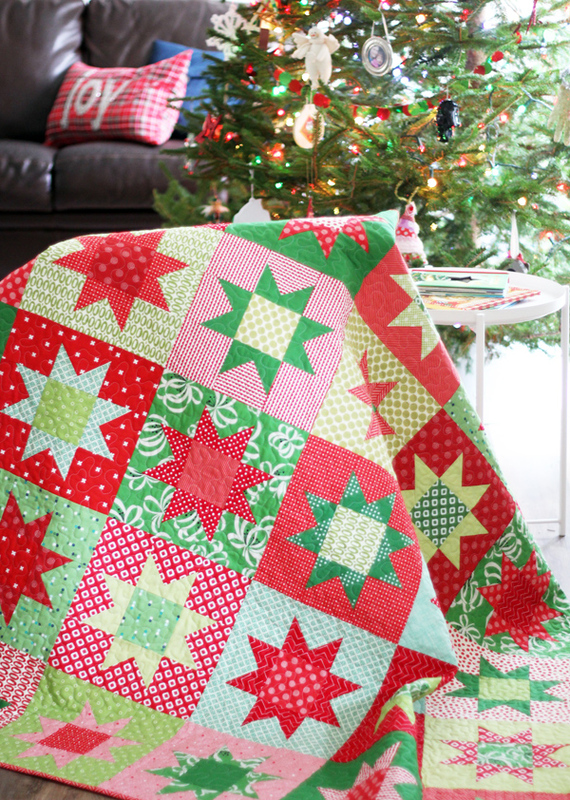 I might try to have it quilted by July for a Christmas in July gift! I absolutely love this pattern. In fact I have recently bought some Christmas prints to start one, and plan as you did to piece it during the holiday season. Thanks so much for your generosity in offering the free pattern! 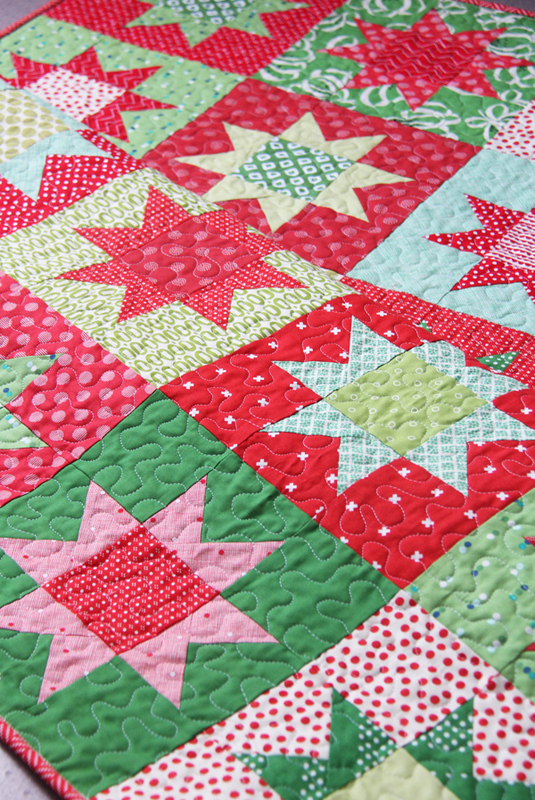 I love your pattern and have a tub of Christmas prints just waiting to be made into No Point Stars. Thanks so much for sharing your pattern! this is the cutest quilt ever I want to make one for all of the seasons. Maybe a special one for my baby Lauren. I made this pattern in red, white, and blue patriotic prints as a “Quilt of Valor” for my dad this past summer. The smile on his face when he received it was amazing. He passed away December 1, 2018 and I will cherish the memories. Your quilts are so beautiful with all of the colors, super inspiring. The no point star sounds right up my alley! Precision is not my strong point in quilting, so far. :/ Also, I love that Darth Vader is on your tree! Oh my gosh, your quilt is SEW CUTE! I love those colors and prints, such a modern take on a traditional block! Thank you so much for sharing your pattern with us too! No points is genius! How clever of you. I completed 2 Christmas quilts this year and have another one on the wall. Two others that have been waiting years to be quilted. I absolutely LOVE the COLORS in your quilt! They coordinate beautifully. I might have to add this one to my list for next year. Looks easy enough. Thank you for the free pattern and free inspiration. Thank you for sharing this fun pattern. I can see so many different color ways. Reminds me of the versatility of the “Yellow Brick Road” pattern. wonderful gift. Thank you. I am doing foster children quilts and QOV. This star will be perfect for either. Hope I can find some glow in the dark fabric or at least put highlights of glow on the dark thread or paint. Thank you for the free pattern!! I love it and I wanted to make a new Christmas quilt. Nicely written pattern, easy to follow. I am making my stars wonky. Your color thoughts are helpful for those of us who love wild prints that end up looking psychedelic, lol. I am making a little tiny quilt, easy to finish. 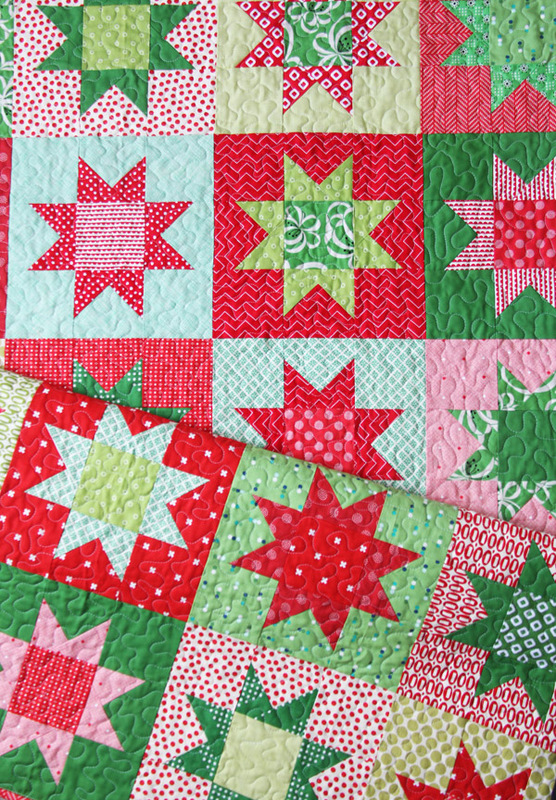 Allison- This quilt pattern has been a great gift to the quilting community. It has been used in many block swaps. I have made this in patriotic prints and will have a Christmas quilt done for next year. Forever grateful for this pattern. I’m so glad it’s been so helpful Kathleen! That was my goal! :) Merry Christmas!